Darnall's Chance House Museum offers a lighted patio tent that provides a beautiful setting for elegant parties, corporate functions, and other special events. The 30' x 60' tent seats 125 people comfortably and is large enough to accommodate a dance floor, buffet tables, bar and a band. The tent also comes equipped with sidewalls in the case of inclement weather. 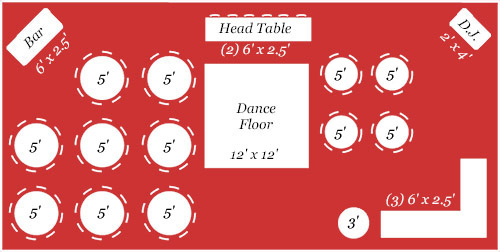 View a sample layout of the Lighted Patio Rental Tent. Darnall's Chance House Museum requires that you hire a professionally-licensed caterer for your event. A warming kitchen is available for your caterer's convenience.